Congratulations to Carl Jones with this image. Carl gives us an insight into how he captured the image. 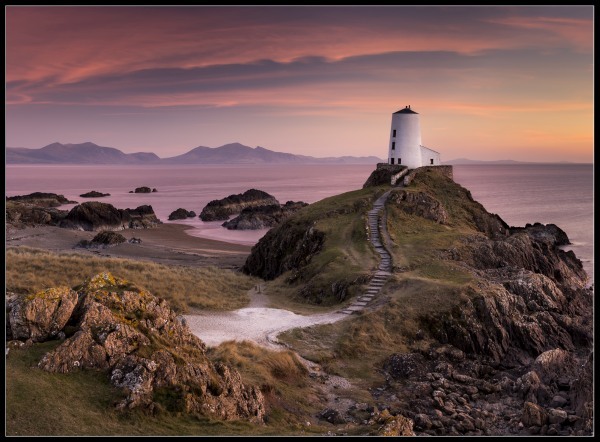 Location:- Llanddwyn Island, Newborough, Anglesey, North Wales. Camera, setting and technique:- Nikon D600, with 24-70mm Nikkor lense @ 35mm. Giottos tripod and ball head. ISO 100, 6 Sec at f/13. ''ND Graduated Filter (can't remember the strength, although its probably a 0.9 as this is what I use more often than not). I can't be positive, as I usually take the polariser off for Pano's, but I'm pretty sure I had it on for this photo, and this would explain how I managed a 6 second exposure. The photo is a stitch panorama which I cropped down to this more attractive composition. I think the original Pano was 6 portrait orientation photographs, but I cropped a fair amount off for this final image. The sky was looking promising when I arrived, and to the right of the photograph, at sunset, the sky was on fire. And even to the left the sky was colourful, whilst the sky behind the lighthouse was featureless and bland. Then for a minute, the high clouds picked up a faint pinkness. Thankfully the camera with a 6 second exposure could see more of the pink than the naked eye.